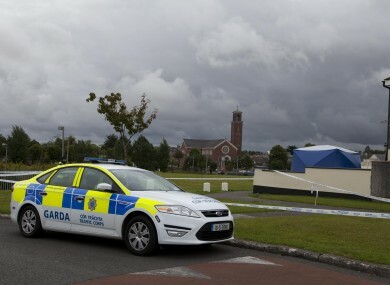 Gardaí at the scene of the shooting last weekend. GARDAÍ INVESTIGATING THE fatal shooting of Jason Doogue in Athy on Friday evening have arrested a woman in her 30s. She was detained yesterday afternoon in the Co Kildare town, and is being held at Newbridge Garda Station under Section 50 of the Criminal Justice Act. A man in his 40s is also being questioned, as is a young man in his teens. A third male – also in his teens – was released without charge from Leixlip station last night. The attack happened at 5pm on Friday. A number of shots were fired at close range by a hooded gunman on a push-bike. The 22-year-old was pronounced dead in hospital. Gardaí are appealing for witnesses or anyone with information to contact them at Kildare Station on 045 527730, to call the the Garda Confidential Line 1800 666111 or to contact any Garda Station. Email “Woman arrested over drive-by bicycle shooting in Athy”. Feedback on “Woman arrested over drive-by bicycle shooting in Athy”.